i've got a gift for you..
Another cultural phenomena for the nerds, initiated after a massive success of The Big Bang Theory; who too follows up the similar path, comes this eerie, not-your-usual-sitcom and is definitely not for everyone, where content is considered prior to the punch line of the joke which is why it has the potential to withhold its existence and maintain its quality for longer period. 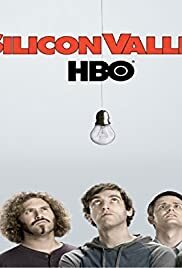 Silicon Valley is a finely detailed insight on the technical world and is infomercial to the outer world where the writer keeps its smart in here and doesn't spend its time wasting on explaining the actions or events (even the references mentioned) occurring in here which makes the audience engaged throughout the course of it in order to not get derailed. As mentioned earlier, it is not a "hilarious" show and fortunately nor does it aspire to be which eliminates the ridiculous efforts of it that usually sitcom falls into. One of the major dilemma in here would be the strength of the star cast, that isn't convincing on performance level which is non-negotiable. The supporting cast like Kumail Nanjiani and Martin Starr is what helps draw out the most of the laughs from the series and is also an example of perfect bonding as the relation is quite similar to a sibling where both the parties is trying to prove their superiority. The second season is about the exposure of the technical guys to the outer business world and strategies that they are unaware of and somehow has to tackle it all through their own perspective, agenda and tactics which creates these chain of events that are both hilarious and troublesome to encounter keeping the audience on the edge of the seat. It may be an important episode for the development of the plotline but it certainly isn't an intriguing one for its main track isn't as humorous or gripping as the writers think whilst its tiny fun bits among the characters and their chemistry is something that the audience rely upon.